After one last Portland brunch with my brother it was a beautiful few hour drive down to the ghost town of Mount Shasta after ski season ends but before hike/lake season begins. We stayed in a little cabin some guy has built in his backyard, and was clearly decorated by a single heterosexual male who spends more time camping than shopping. That is, it looked fine to me./I liked it. We found an organic, vegan, local, gluten-free, homemade, artisan, raw, carbon-neutral, ayurvedic, probiotic, non-gmo, non-hfcs, non-pgh (I’m just making up acronyms now) cafe, where we enjoyed a tasty bowl of soup and a sandwich while watching the sedate procession of parka-clad and dreadlocked individuals drifting through to the open mic in the back room where an earnest young man was strumming an acoustic guitar and telling us about love. It was awesome. They had checkers too. The next morning was light sticky snow, and since, given the chance, our economy-class rental car would slide like a hockey puck, we left early to drive down to Mendocino, munching on food bought the day before at the incredible Ashland Food Co-op. Passing through Redding, I decided on a whim to pull over and see the Sundial Bridge. We found it, saw it, and halfway through crossing it heard screams of “hey!!! HEY!! !” coming out of the woods. The screams were followed by a young male, hands wrapped in an extra wool parka-thing. As he saw us and got closer he remembered what he meant was “HELP!! !” He stumbled up to us. I stepped in front of K, eyes on his hand, hidden in his parka. I’ve narrowed my guesses to two: 1: he has a gun in there and is about to shoot me. 2: he cut off most/all of one/both of his hand(s). The hands drop, the parka drops to the ground, carrying some brightly colored spiritual self-help book with it, his hands…reach out for me, clean and weapon-free. I can’t remember everywhere the discussion went, although I remember his heartfelt conviction that he need to learn all the languages of the world in order to communicate with everyone, his certainty that he should start with Latin, and his genuine disappointment when we told him we couldn’t teach him Latin. As entertaining as it is now, he was in a fragile place, and the message to remember is: if you are going to take a psychotropic journey, take a guide. This kid should have had someone with him, because he was picking up and mirroring whatever minute signals we gave him. So I tried to be reassuring and appreciative, and invited him to cross a bridge with us. 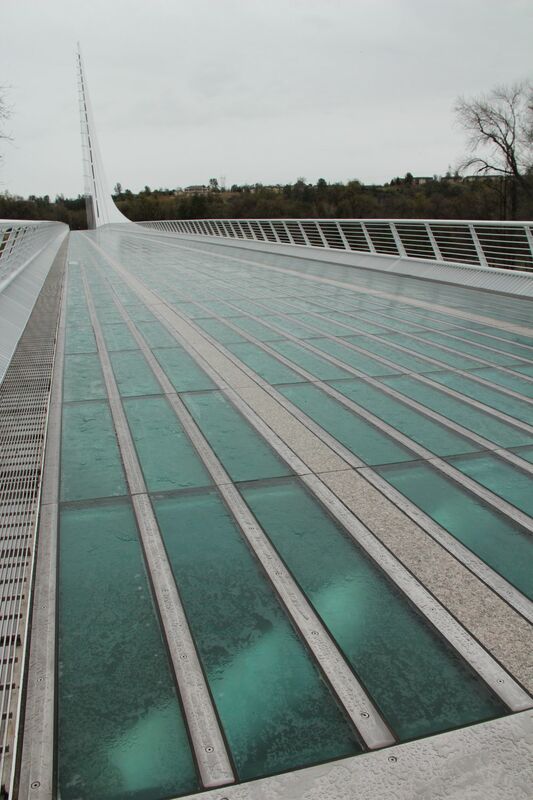 We walked back across the Sundial Bridge. My heart was breaking for this poor wide-eyed kid, but I wasn’t about to bring him 250 miles to the coast. God I hope he found friends there. If whatever bored teenager who was dishing up coffee that morning treated him badly… I wish that kid well. And remember, if you are going on the dream path, get a guide.